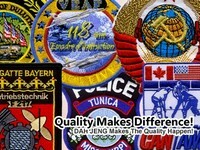 Established in 1983, being an experienced embroidered patches manufacturer and exporter, Care / Effort / Patience / Happiness are four qualities that Dah Jeng Embroidery Inc. has always been carrying along the way in the industry for over 30 years. From military, sports, scout, police department, biker to corporate and cartoon patches, we're specialized in producing embroidered patches of all kinds. It is unfortunate that we can't not share them all online for confidentiality reasons. Resize the good old fashion patches, we also love to explore the possibility of combining the art of embroidery with other products. Luggage tags, for examples, are one of our best-sellers. Therefore, OEM and ODM opportunities are more than welcome. There's nothing better than helping our valued customers to realize their projects. What we offer are products with fine quality and competitive prices. Strict quality control and prompt delivery are our priorities. Not to mention our attentive and friendly service have always received high credit from our customers from around the world. 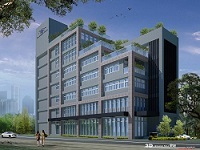 Company president Mr. Tony Yang is the founder of Taipei County Embroidery Association. 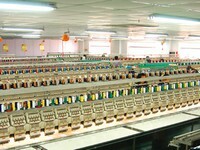 He has been dedicated to upgrade embroidery skill and expertise for more than 3 decades. Both of our Taiwan and Nanjing factories will always satisfy your potential orders, bulk or small, with precision and efficiency. Please feel free to contact us if you have any question or need any further assistance. Our experienced sales team will be more than happy to help you. Manufacturer of embroidery ornaments, including embroidered badges & emblems, Chenille Patches, metal medals, key chains, lanyards, fake cloisonne, photo etching, heat-seal flocked patches, heat-transfer printing, hand made bullion wire patches, hard enamel lapel pin, soft enamel lapel pin, printing lapel pin, flashing lapel pin, keychain, pewter product, necklace, patch, medal, other lapel pin etc. We also provide direct embroidery service.